On the Virgin train www.virgintrains.co.uk to Chester to catch the onward train to Llandudno, we discovered individual portions of soya milk by Miko Plus www.mikoplus.com.pl ! As regular readers will know, we decant Alpro soya milk www.alpro.co.uk into two 100ml bottles bought from Muji www.muji.co.uk as normally we can’t find soya milk when we travel. On this occasion, we were lucky and were able to enjoy soya milk served with our cup of tea. 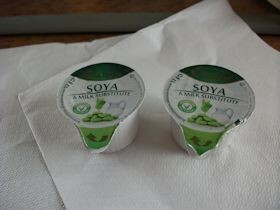 Wouldn’t it be great if these soya milk portions were available elsewhere such as on airlines? Food-wise we weren’t so lucky, but we had already bought some provisions from Pret A Manger www.pret.com at Euston station before we left. At Chester station, we enjoyed a further reviving cup of tea at the Costa Coffee www.costa.co.uk branch at the station. 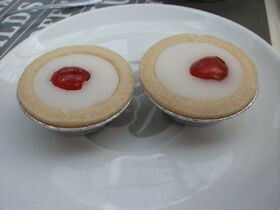 I made a further discovery – gluten free and dairy free cherry bakewells. When I asked whether they had any gluten free cakes, the assistant in the coffee shop showed me the gluten free symbol on the packaging to indicate there was no gluten. In a hurry, I would never have realised this was a gluten free product! We were delighted to learn (by reading the small print) that they were also dairy free so Ray could share the twin pack with me. As you know, dear reader, it is a constant challenge to find gluten free and dairy free combined products. 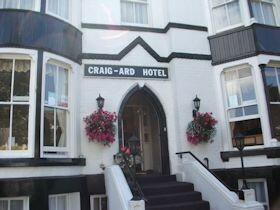 www.craig-ardhotel.co.uk where we received a friendly welcome. 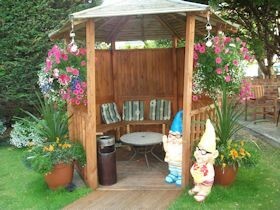 This hotel is perfectly located minutes away from the town centre and seafront. 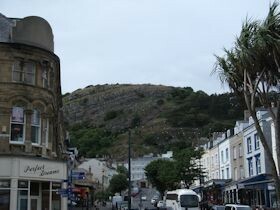 As a first time visitor to Llandudno, I was delighted by this charming and elegant Victorian seaside resort. 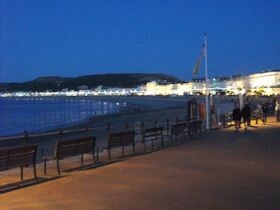 The seafront was reminiscent of Nice. That evening we dined with friends at Osborne House www.osbornehouse.co.uk , two of whom also had food allergies. 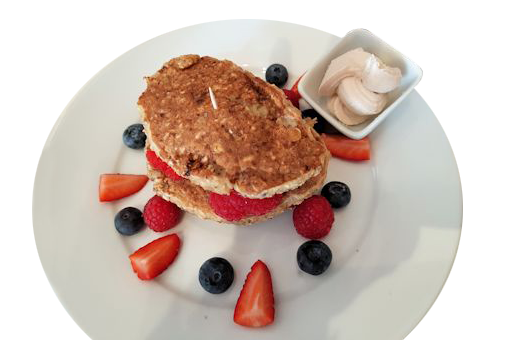 We had contacted the hotel beforehand to inform them so they had selected dishes that were gluten free and dairy free. For a starter, Ray and I had melon and prawn cocktail. 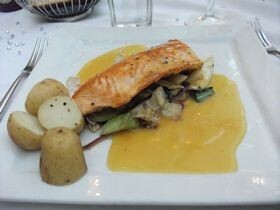 For the main course, Ray enjoyed lamb with new potatoes and carrots while I chose salmon. 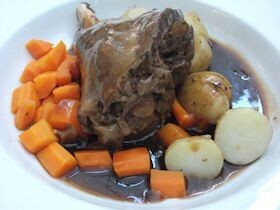 A choice of vegetables – broccoli and carrots (with no butter) was shared on the table. 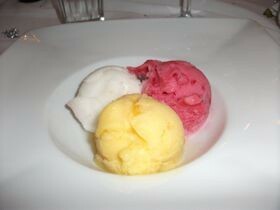 For dessert, we both had trio of sorbet – a refreshing end to the meal. 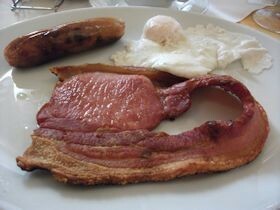 The next morning, we waited in eager anticipation for our cooked breakfast at the Craig-Ard Hotel. 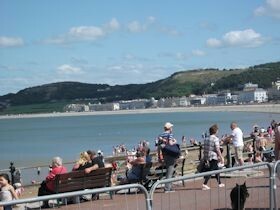 As you walk round Llandudno and look up – there is the Great Orme and apparently, it’s a must see in Llandudno. 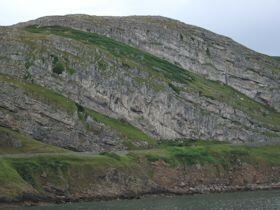 The Great Orme headland is a massive chunk of limestone rising 207m/679ft straight out of the sea, so it’s no surprise that its name, given by the Viking means “sea monster”. After breakfast, we decided to go up the Great Orme with our friends Alan and Do by cable car. It seemed a good idea at the time, except it poured down. 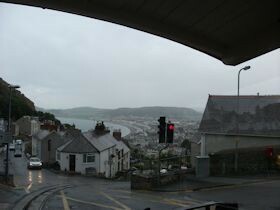 The problem was that the sides of the cable car are open so the rain is blown in. We felt sorry for a couple of women in summer dresses, but as they explained when they left home it was brilliant sunshine. As the cable car ascends, it is truly spectacular with amazing views. When we reached the top, we were soaking wet so made a dive for it into the visitor centre. We will have to revisit it another day when it’s fine so we can admire the view. 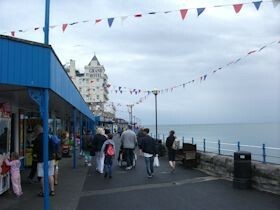 Back in Llandudno, we had a walk along the pier wearing our ponchos (what else?) 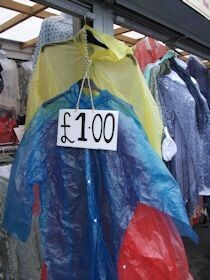 but it was pretty miserable although you could buy a bargain poncho at £1. That evening we enjoyed a meal at The Cottage Loaf www.the-cottageloaf.co.uk winner of the Abercolwyn Food Pub of the Year. 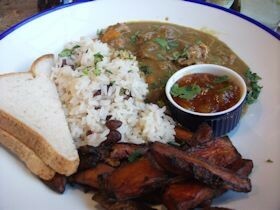 Its menu did indicate which dishes had a gluten free option, although these were few and far between. 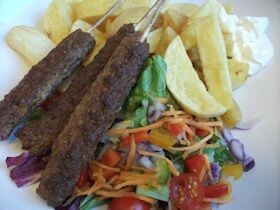 Ray decided on Grilled Lamb Koftas with chips and salad, £12.95, while I sampled Homemade Jamaican Conwy Valley goat curry with coconut rice and peas, sweet potato chips, mango chutney and gluten free bread, £13.95. A fitting end to an enjoyable – if wet – weekend.